Painted up Marcus yesterday, so guess I've already done my pledge for this month (I really should of gone higher than Hench, too late now tho). It's time to see how much of his theme I can do before the end of the month. Already got his box primed + have Vogel/Scorp in the post. I'm feeling good about my chances of completing another keyword. Put me down for a pledge of another Portal fireteam, Adeodatos, and (if it arrives in time) an Immolated Rhino. I'll also be basing my entire CotBM company. To start with for March, I'll finish up these two Silurids, a Will O' the Wisp, the Adze, and Talos-as-Knightly-Killjoy. If I get those done I think I'll reward myself by starting on painting the Avatar Colettes I was gifted as "basing" for my actual Colette's Doves. 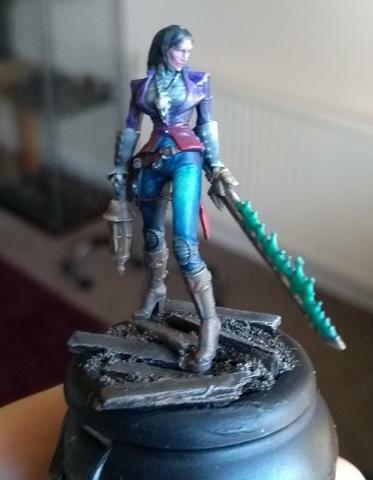 Ohhh, it looks like Viruk's kitty is the most popular cat in Malifaux? What about pledging cats too this month? I could add some cats to my annoubced scenics pledge! OK, here my final pledge for this month. I will paint two Cojos and two Jackalopes. Both will feature bright fur so batch painting should be more efficient here. 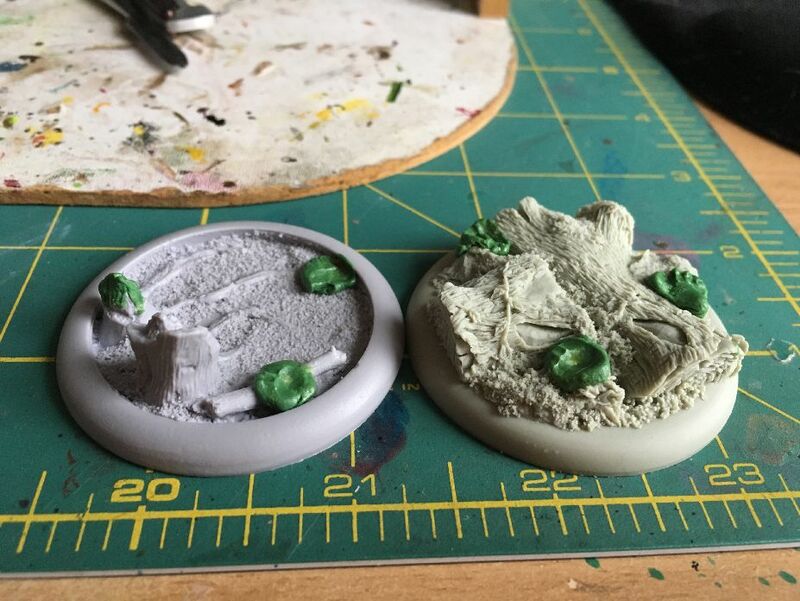 And here's a quick PRO TIP regarding bases. 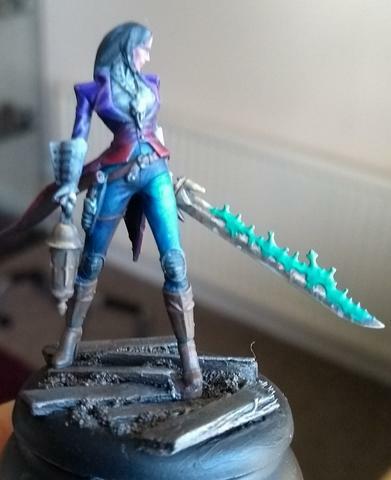 Typically fitting standard models is not an issue as they have flat soles of their shoes (especially the humans of Malifaux). However, sometimes it gets more complicated, and Cojo is a good example. 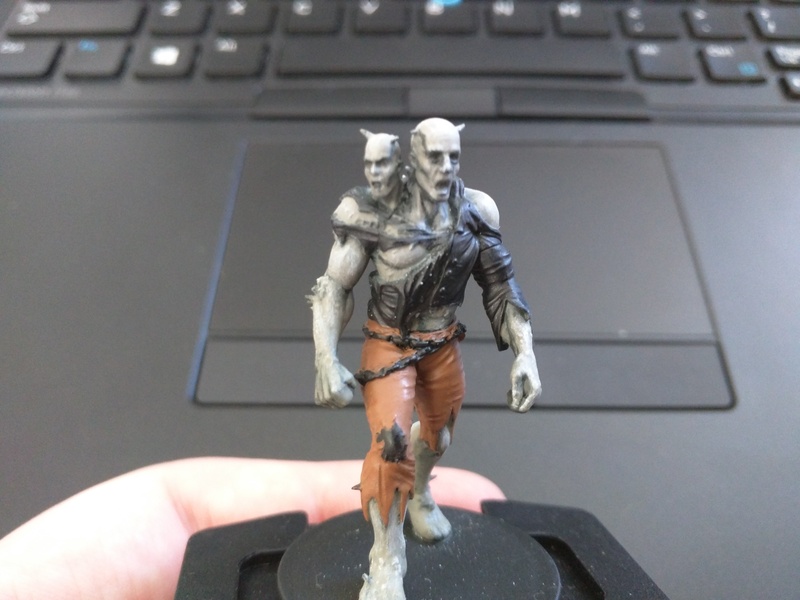 It's not easy to fit him into a 50 mm base, and it gets worse when it's a resin one with some terrain on top of it already. I solve this problem by adding small pieces of GS to where I want the model to stand (obviously that takes some dry-fitting to find the best position). Once the GS is in place, I put some water on it and gently press the model from above. After a few seconds I take it away. The indentation serves as a perfect guideline for later work. Since it doesn't look too good at this stage, I wait for it to dry and add a second layer of GS with some texture. If your sculpting skills are (like mine) very low, you can always add some static grass there to mask it. 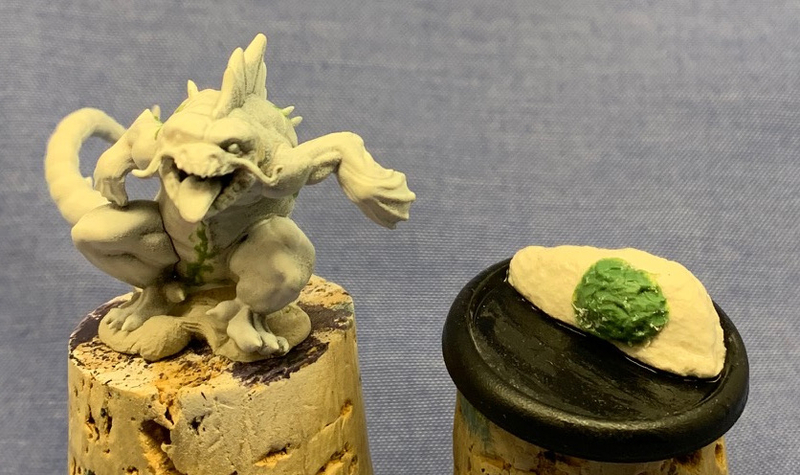 After that it's just a matter of pinning the model and you have a perfect fit that makes it look like the base was designed to go with your miniature. Neat idea I must shamelessly steal borrow. @Purple Mist, @Viruk: I'd be so behind a cat-themed painting month! As well as my Curiosity set, I have this guy. 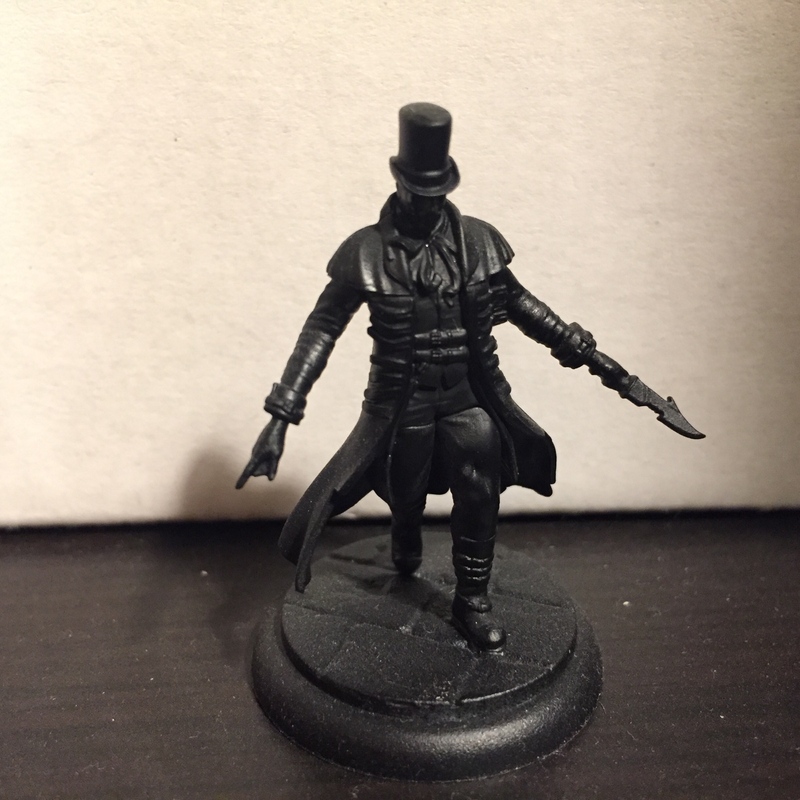 Here's my March pledge, after having him built and printed for months, I'll finally go for the Midnight Stalker for 8SS. I want to try to give him some kind of night lighting, but I'm still not quite sure how to do it, so... wish me luck! @Diddick: Check out Spiraling Cadaver. I found about him when i joined the "deck of painting achievements" and is definitely a style that I think fits perfectly for the midnight stalker. @Diddick: If you can find a cheap scale streetlight, that would make an awesome lighting effect! (Note to self: try this myself). Greenstuffworld have LED ones I believe. Might be a nuisance getting them to Australia though! Think Sonnia is approaching completion, if only because she's causing me an unsustainable level of eyestrain. Soz for the crap photos. They're partly due to my phone being broken and part so you can all share in my pain! 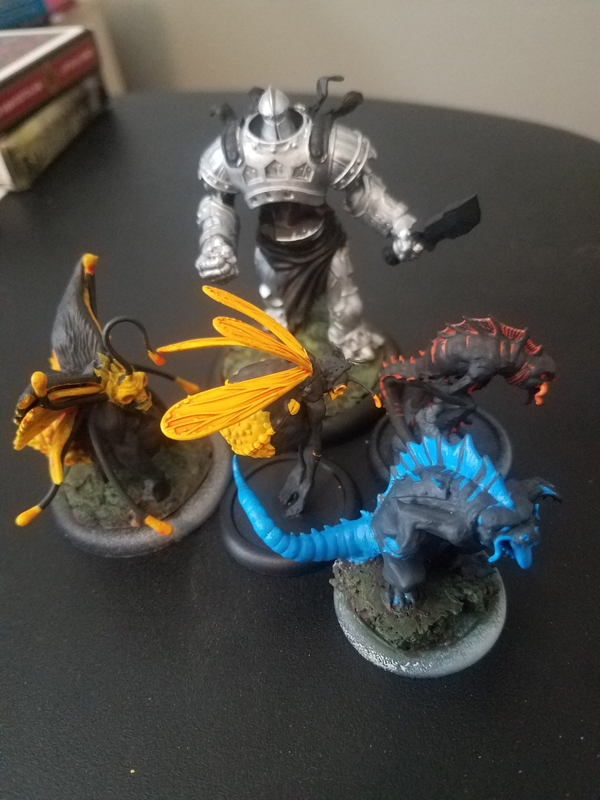 I bought a lot of minis from raging-heroes but I did not assembled anyone at present. Like the face of that model: looks like you are doing a great painting job. Thanks for the kind words @Burnin' Coal and @Purple Mist. I'm not really feeling the model anymore so it helps to keep the motivation up to finish her. Started working on one of the warped. Got the skin mostly done, and I've got the base coat on the pants done. I could you some help on hashing out the scheme though. 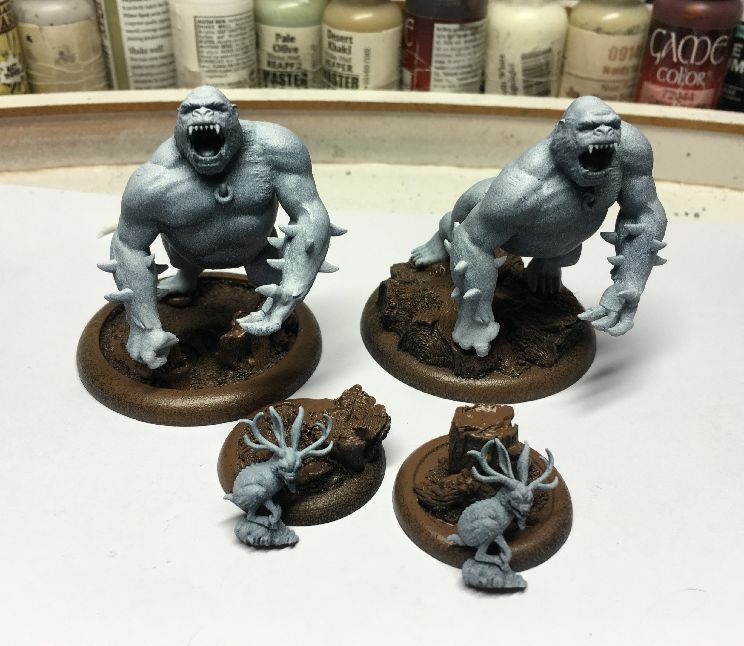 My idea for these guys is to go for ash-y looking skin and for worn out cloths that are some mixture of red, orange, or yellows (its cult of the burning man, so I figured that would make sense). It doesn't have to be straight for those colors. The paints in this picture are a brown, that I'm going to hit with a wash to add some more color into. The other think I want to do is add some osl "magic" like effects. My plan is to use the complimentary color to whatever colors are used in the cloths. So for example if this guy has orange pants, he would have a blue glow. 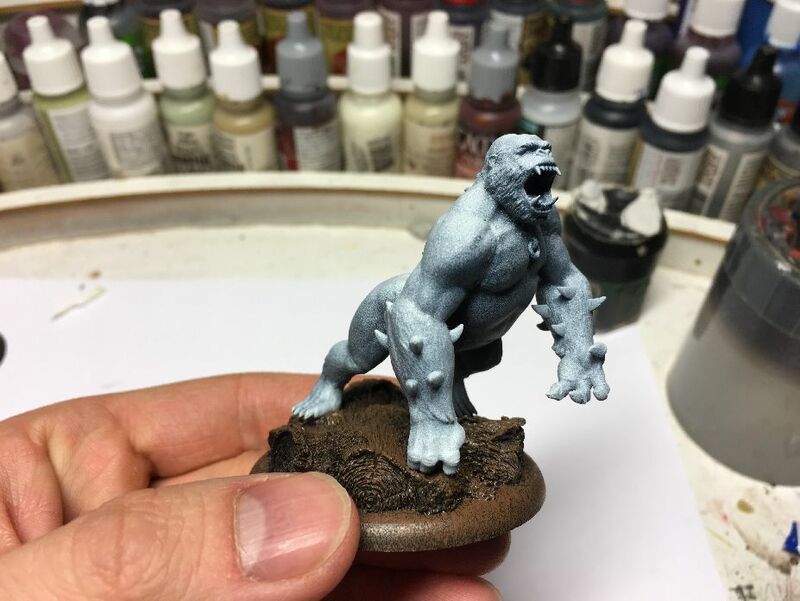 The problem is I'm not really sure where to add the glow for this guy. For something like the doomseekers its fairly obvious on where to put it. For this guy I'm having some difficulties figuring it out. If anyone has any advice for this guy specifically or the theme as whole I'd love to hear it. You could do the glow coming from the eyes/mouths, but there isn't much of it that would fall onto the model if that's what you're looking for. Or you could just pick a corner of the model to glow up and pretend it's lit from off camera. Put him beside your other models as an excuse. Glowing eyes are an easy way to add some pizzazz. 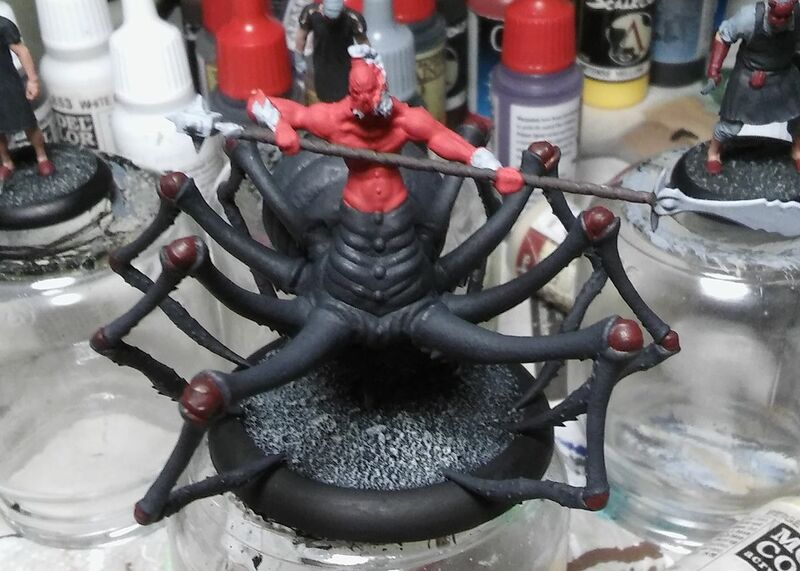 Been doing some basecoating on my Jorogumo amidst other projects. I forgot how long these guys take to paint. So many limbs, all in each others' way. Cool models though. Looking good! Reminds me of something out of the older Mortal Kombat games at the moment.